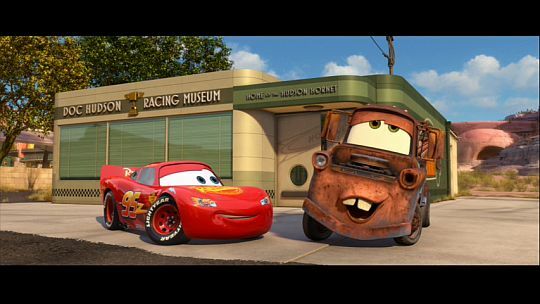 Mater: Is So Much More Than Just A Tow Truck!. . Wallpaper and background images in the Disney Pixar Cars 2 club. This Disney Pixar Cars 2 photo might contain minicar. I can see his kindness in his eyes. He has eternity and heaven in his eyes. Can he get much better than that? I LOOOOOOOOVVVVVVVEEEEEEE his accent. I love his smile. I love the way he says things at either the right or wrong times. I love his curiousity. I love his laugh. I love his catchpharse, Dad-Gum. I love the way he moves. I love it when he gets so excited that he gets annoying. I LOVE his intelligence. I love EVERYTHING about Mater! But I hardly know a thing about him. I would love to know a lot of things about him like, What does he do doing his free time (when he's not too busy working)? Does he read or do art or tell stories or attract females (considering that he's a lady's man)? HOW does he reproduce? Like a dog would, or like a dolphin would? Does he believe in God? What is his other favorite foods and etc...? I just can't believe that when I first saw Cars 1, all I ever did was HATE that beautiful Tow Truck. Wh'd you HATE him back then?